/ Home / Alumni and friends / Alumni / Meet our alumni / Marine, earth, geography and environment alumni / "Buy a decent pair of walking boots that won't leak!" 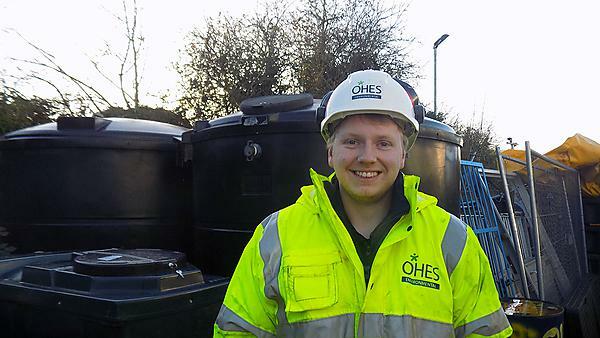 Since completing his studies in 2013, Lewis actively pursued a career within the environmental sector specialising in hazardous materials and contaminated land. He is now working as an Environmental Consultant for OHES Environmental Ltd in Birmingham, managing geo-investigations and incidents involving the loss of hydrocarbons that require soil assessments and risk mitigation works. "Honestly, Plymouth did the job for me." For anyone wanting to pursue a career within the environmental sector, the University of Plymouth is uniquely located and successfully utilises the natural surroundings of the South West. From rocky outcrops on Dartmoor to the unique Devon coastline, it offers teaching both in and outside of lectures that helps prepare any environmental scientist in the making. I was recommended the course that I wanted to do (Environmental Science) by friends and word of mouth. The library was my main source of information as well as the lectures. My second year and final year tutors were very helpful on the mental health support side of things and helping me to focus my university studies to where I wanted to work. Shout-out to John Maskall and Malcolm Nimmo. Plymouth gave me a good heads up of what to expect working in the field. Be it getting drenched during field exercises on Dartmoor or tight report deadlines. The Environmental Science course at times is not for the light hearted, such as exhausting field work and producing technically sound reports. But that’s exactly what I wanted because I knew that’s exactly the experience that I needed to work in the environmental sector. The one memory that stands out was our second-year expedition to Malaysia. Our project was to investigate and analyse the impact of a landfill within a section of rain forest. As I had highlighted that contaminated land was what I wanted to go into I was actually thrilled to be part of that particular project and relieved that I was on it as the trip itself was quite ecology based. The most exciting thing I have done/do is working in areas and on sites that people only read and hear about. These include, but are not limited to, being winched into an underground water reservoir to survey for hazardous building materials and spending night and day on oil depots to assess fuel losses from tankers. As I wanted to go into the contaminated land sector, a minimum is knowing how to log soils to industry standard. Turning back the clock, I wish I would have done that sooner. As I am in a role that requires a medium to high level of scientific/geological knowledge linked with technical/mechanical needs I would have tried to focus more so on these. Also, I would tell myself to buy a decent pair of walking boots that wouldn’t leak! !